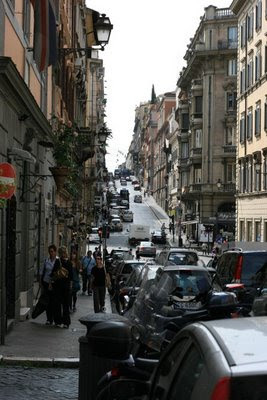 Rome radiates busy, beautiful, happy city vibes. The residents are, for the most part, very well dressed and stylish as they weave in and out of traffic on their scooters or in their tiny hatchback cars. The only thing about Rome that detracted from the ambient loveliness was the presence of way too many pushy street-vendors. As we stood at the Trevi Fountain, vendors buzzed about like aggressive bees trying to sell me roses, plastic dolls, fake Prada bags, photo-taking services, weird flying toys, cheap scarves and tacky posters. My mantra was, "no grazie" along with a shake of the head. These vendors sent their cousins over to the Coliseum and the Spanish Steps too. I wanted to soak in the beauty and history of these sites, but was distracted. On Monday, June 16, Chad and I woke from a long night of good sleep for yummy, free hotel breakfast of rolls, cheese, fruit and the best cappuccino I've ever had the pleasure of drinking. Then we were off to the Vatican Museum, Sistine Chapel and St. Peter's Basilica. Guess what? No vendors! The Pope does not allow that foolishness! The Vatican Museum is like a crazy hodge-podge of antiquities with no clear rhyme or reason to the collections. The Sistine Chapel lives up to its reputation for sheer volume of painted surfaces and beauty. (If you've never seen the movie The Agony and the Ecstasy, I urge you to view it.) But my favorite thing in the Vatican City was St. Peter's Basilica. My description of the architecture, sculptures, mosaics and awe-inspiring aura simply can't do it justice, so I won't try. Chad & I were both battling sensory overload after Vatican City, so we scurried back out the gates to Rome-proper and found a little sidewalk cafe for lunch. My margherita pizza was fine, but I expected big basil leaves and freshly sliced tomatoes, what I got was more like a school cafeteria pizza. Maybe lunch-lady Doris studied her pizza skills in Rome? On Tuesday, June 17, we had a free day and chose to go to the Capuchin Crypt. We read about this place is Esquire magazine, and as luck would have it, the crypt was half a block from our hotel. When the Cappuccini monks ran out room in the burial chambers, they took the old skeletons and made elaborate decorations all over the walls and ceilings with bone fragments. The effect was both beautiful and chilling. The inscription on the floor in the last chamber reads "What you are, we were. What we are, you will be." After the Capuchin Crypt, the visit to the catacombs later in the day was anti-climatic. Like all good tourists, Chad and I went to the Mouth of Truth and snapped photos of each other sticking our hands in the mouth. We both still have our hands, so I guess we're pretty honest. Tune in tomorrow for tales from Positano and the Amalfi Coast region.